You are about to embark on an adventure around the world with your kindergarten child! We’ll be visiting each of the seven continents and exploring the amazing places found on our planet earth! This is a gentle but exciting tour around the world. You’ll meet children from around the world whose lives may be very similar or extremely different than your own in Children Just Like Me: A new celebration of children around the world . You’ll also explore the different ecosystems and animals found on each of the seven continents in the Nat Geo Wild Animal Atlas: Earth’s Astonishing Animals and Where They Live (National Geographic Kids) . You will of course enjoy great literature selections, giving you a glimpse into the life and culture in different countries. Stories like Little House in the Big Woods (Little House, No 1), Linnea in Monet’s Garden and Mr. Popper’s Penguins will captivate your child and introduce them to longer stories. In addition to listening to these beautiful stories, you will complete a variety of activities to tie in science, life skills and more. Your child will enjoy the short, simple poetry and gorgeous photography in the National Geographic Book of Animal Poetry , and create a variety of fun art projects from the book Around the World Art & Activities: Visiting the 7 Continents Through Craft Fun (Williamson Little Hands Series) . You will also learn about what people eat in other countries as well as try out some of the 40 international recipes found in the The Kids’ Multicultural Cookbook (Kids Can!) . 40+ pages of notebooking activity pages (including maps), and animal research projects. Note: The Narration Cards, which are included in Levels 1 and up are not included in the Level 0 Kindergarten, as I do not normally recommend beginning formal narration until Level 1. If you feel your child is ready or if you are using this with an older child, you can purchase a set of narration cards separately. Why Are the Ice Caps Melting? We are about 1/3 of the way through BYL’s Kinder program. We’ve been all over North America, including Canada, South America and Europe. We are getting ready to move on to Africa this week and my son is so excited. This has been such a fun and educational “journey” for him. He is gaining a much wider perspective of the world, it’s cultures and people, as well as the animals of the world and their habitats. He is fascinated by the other children and their way of life. 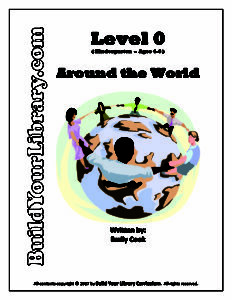 Have you already purchased Level 0 – Around the World? We would love to hear what you think and share your experience with others – Please feel free to leave a product review on the Contact Us page! Thanks for your support!